Melt the chocolate in the microwave at 50% power in 15-second intervals, stirring in between each cycle. While the chocolate is melting, crush the graham crackers with either your clean fingers or with the bottom of a drinking glass until they're the texture you desire. I kept mine with more coarse than graham cracker crumbs. 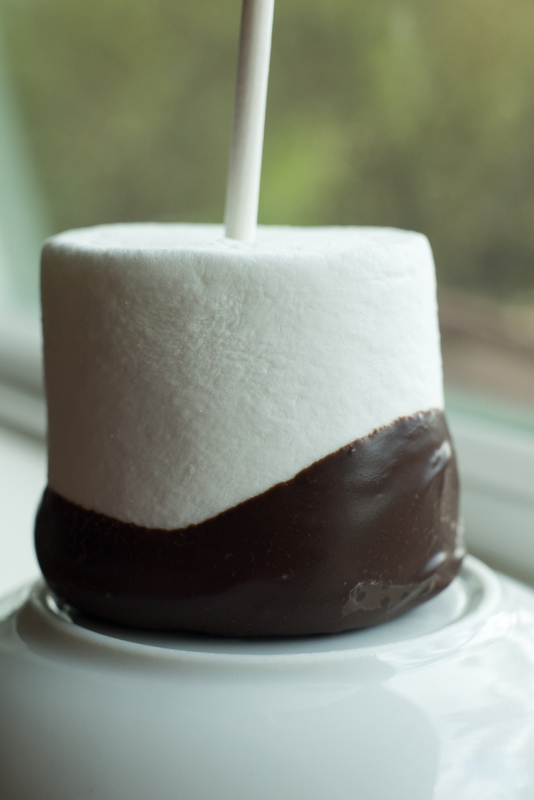 Once the chocolate is melted take a marshmallow and dip one end in chocolate. I used a second marshmallow to smooth out the bottom of the first marshmallow and to prevent excess chocolate accumulation. Then transfer the dipped marshmallow into the graham crackers and coat to your desired effect. After dipping in chocolate and graham crackers I stuck a cake-pop stick in the marshmallow for easy snacking and stuck the treat in a foil-lined cupcake liner, but those steps are completely optional. I let the treats set-up over night and they were perfect the next day. I also made a "naked" s'more treat for one of the children in my son's class who has a gluten allergy. This simple recipe could easily be adapted by using smaller marshmallows, different chocolates, or different toppings, like sprinkles, nuts, Oreo crumbs, etc. For more tasty goodness check out Carolyn Lowe's Burrito Bowl recipe.